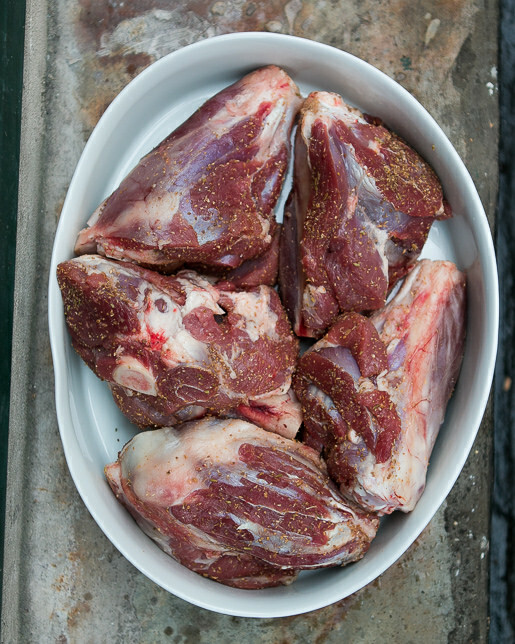 When I moved to France, I was surprised that lamb shanks were somewhat hard to find. Many butchers sold all sorts of cuts of lamb, including lamb shoulders, ribs, and cutlets, but shanks proved elusive. Then I learned that you had to ask for them; for some reason, they’re always kept in the back. I’m not sure why, since it’s my favorite cut of lamb and it deserves to be out in the open. 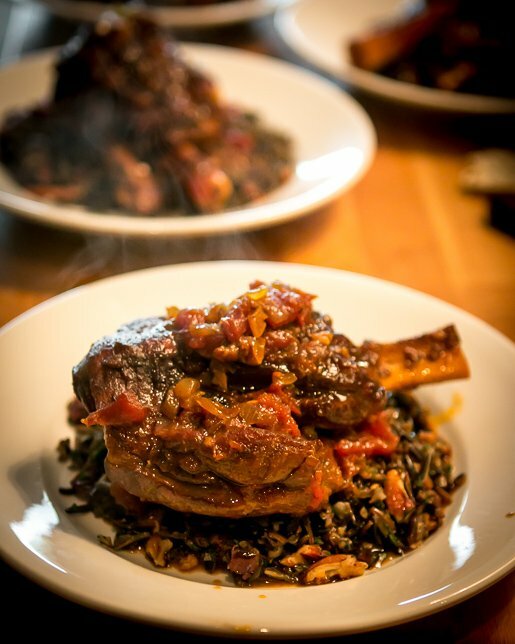 Souris d’agneau (lamb shanks) don’t require a lot of work. They rely on time, which turns a tough cut of meat into something soft and succulent. And with shanks, each person gets their own portion, which makes a nice presentation. Last spring when I was on book tour in Houston, Joshua Weissman stopped by to say hi. At the ripe age of seventeen, Joshua runs a blog called Slim Palate. Joshua had been a hefty kid and decided to do something about it. So he challenged the way he ate, began eating healthy foods, and cooking for himself, which is the best way to eat well. By doing so, he lost a whopping hundred pounds on a Paleo diet. It was such a success, that kids who’d previously teased him about his weight at school started asking him for advice. So yes, it’s true: eating well is the best revenge! I took a walk over to Belleville, to the butchers that I frequent, who are used to l’américain asking them too-many questions about all the meats and sausages that they sell, including spicy merguez, and whole roasted lamb heads – which, so far, I’ve passed on. The ancho chile powder gives these shanks a wonderfully burnished flavor, and the coffee adds a nice depth of flavor to the liquid. If you can’t get lamb shanks, you could use a lamb shoulder instead. Have your butcher cut it into four pieces for you. If your electricity cuts out, I can probably help you out since I’ve learned a bunch of new terms and phrases, to get you cooking again. Although because it’s winter, most natural light is gone by the time dinner is served around here. Which is something I haven’t been able to figure out how to control. Adapted from The Slim Palate Paleo Cookbook by Joshua WeissmanI used decaf coffee, since I didn’t want my guests to be up all night – or me. If you want to skip the coffee, you could add a cup of water with perhaps a dash of worcestershire sauce or balsamic vinegar, to replace the sly flavor added by coffee. If you don’t have stock, you can use water, as the meat will flavor the liquid pretty well on its own.One thing to note: It’s important to brown the shanks well. Avoid turning them frequently, and let them get well-bronzed, which adds plenty of good, meaty flavor to the dish.I was initially planning to serve these with the couscous with pistachios and lemon from My Paris Kitchen, then at the last minute, switched to wild rice with dried sour cherries. (Cook the rice in boiling salted water until tender, drain. Stir in a generous handful of chopped dried sour cherries while the rice is warm, then season with salt and pepper, olive oil. Let it cool a bit, then add some fresh herbs, like thyme and flat-leaf parsley. Serve warm or at room temperature.) Another option is Israeli couscous with butternut squash and preserved lemons. 1. 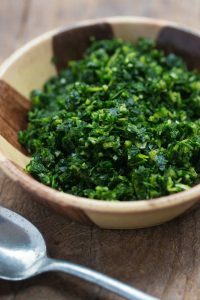 Put the coriander and fennel seeds in a dry skillet, and toast them over medium heat until they smell fragrant – about two minutes. 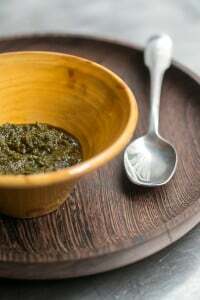 Let cool, then crush the seeds in a mortar and pestle, spice mill, or in a freezer bag, using a hammer or rolling pin. Mix the crushed seeds with the salt and a few turns of freshly ground black pepper. 3. 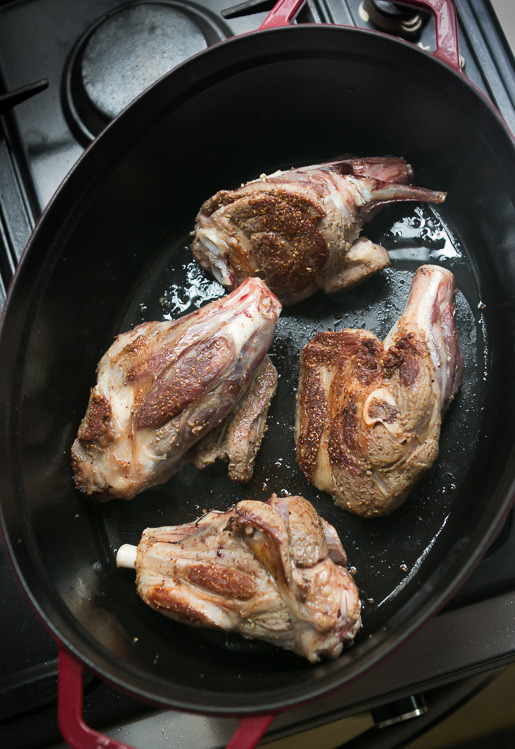 Heat the olive oil in a Dutch oven or casserole large enough to hold the lamb shanks in a single layer. Add the shanks to the pot and cook them, turning them once they’re well-browned on one side, and continuing to cook them, so they’re well-browned on all sides. It should take above 15 minutes, total. 4. Preheat the oven to 350ºF (180ºC). 4. Remove the shanks for the pot and set them on a plate. Wipe any excess grease from the pot and add the onions and garlic, and cook until translucent, stirring frequently, about 5 minutes. 5. Add the ancho chile powder and cook, stirring, for another minute, then add the stock, coffee, tomatoes, vinegar, and hot sauce. Submerge the lamb shanks in the liquid, cover the pot, and cook in the oven, turning the shanks a couple of times during the braising, until the meat is tender and pulling away from the bone. It will take about 2 1/2 hours. 6. When the shanks are cooked, remove the lid and continue cooking, letting the liquid reduce for about 30 to 45 minutes, until the thickness of the sauce is to your liking. 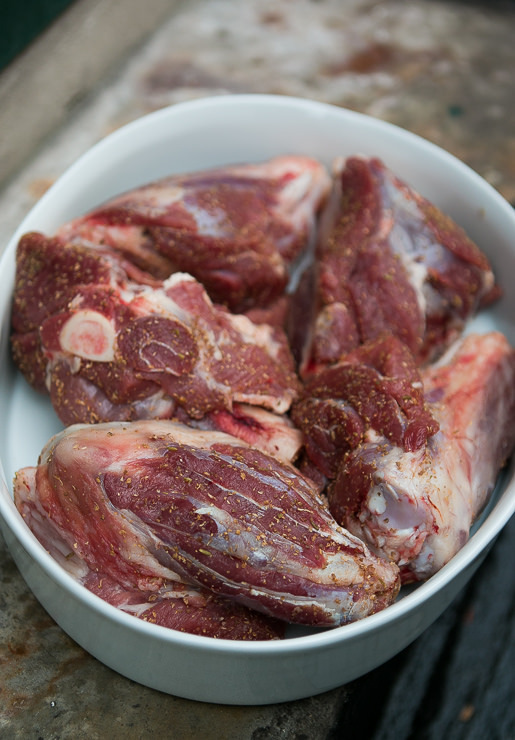 Storage: The lamb shanks can be made up to two days in advance and refrigerated. Reheat them over low heat on the stovetop, or in the oven. This recipe looks absolutely delicious!! I’m not a big meat eater but when I do eat meat I refer it to be lamb. 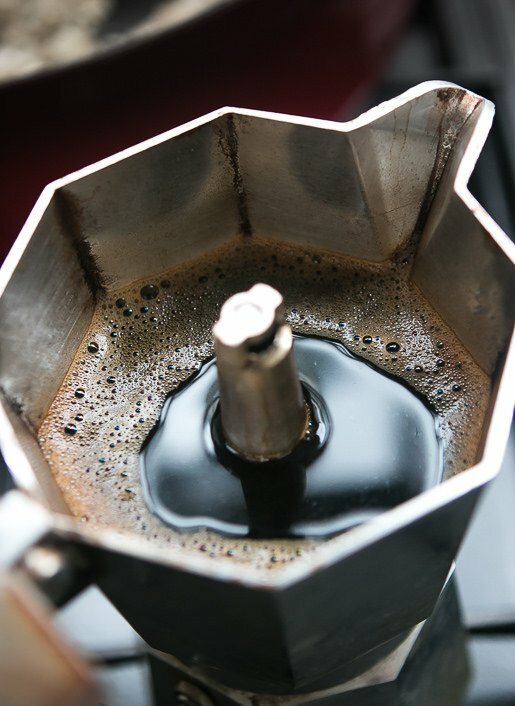 Also, I LOVE coffee, espresso in particular, so this recipe is right up my alley!!! What a great recipe to wake up to! I just made lamb shanks for the first time recently and braised them with some citrus juice. This will be the next thing I try with them! I know when I first discovered Joshua’s blog, I had mentioned it to my husband and discussed what our now 3 year old do when she grows up to be 17. For me, at around 17, I moved to a totally new country alone to pursue higher education. As for this recipe, we are big fans of lamb shanks. This one is irresistible. This is why I’m a near-on fanatical reader of your blog! You always impart knowledge and are never afraid to turn us onto other chefs. Bravo to young Mr. Weissman for his accomplishment in the weight loss and for his delightful blog. I’ve spent the last two hours reading him from the beginning and have already printed out no less than 6 of his recipes. Thank you, David. Gorgeous photos in this post, and the recipe sounds wonderful. Looks absolutely gorgeous! The bigger the shank, the tempting it is and the harder is is to cook. Difficult to find the right balance. David, your recipe looks fabulous. For some reason, lamb & coffee just go together. 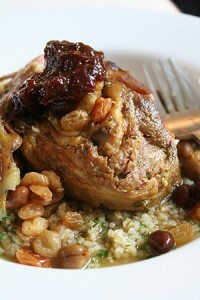 Here’s a recipe for leg o’ lamb I’ve been serving company for years. People BEG to take home the leftover sauce. Elsie Lee was a celebrated hostess on the diplomatic scene in Washington, DC in the 1960s. May substitute 3-4 tsp pumpkin pie spice mixture, but the effect is NOT the same. Remove any obviously excess fat, wipe the meat with paper toweling, and wash your hands. Spread the meat THICKLY with mustard (if it’s a small or medium jar, I used the whole thing.) Then pack thickly with the brown sugar (all of it). Set the lamb in a roasting pan and sprinkle lavishly on all sides with the spice mixture. Place the pan uncovered in a 325° oven and start roasting. Watch it like a hawk after 15 minutes. If the sugar mixture begins to burn, add 1 cup coffee. (I always add the coffee at this time, whether it burns or not.) Continue roasting, basting every 10 minutes with pan juices. Add 1 cup of coffee (whether or not you added the first one). Continue roasting & basting for another hour, or until lamb is doe to your taste. Remove meat to a warmed platter. Thicken pan juices with cornstarch/water mixture, stirring over medium low heat til smooth. Finally – add the jelly & stir briskly until partially melted – leave some small firm bits of it in the sauce. Serve it with a sauce boat. Thanks for the recipe – sounds great. I, too, love lamb shanks, only I find that one is far too much meat for one person – if we have a pack of two, it does us twice. I think I’d serve this with plain mashed potato (or possibly baked) and a green vegetable or three, to cut the richness. Or, since it would do us at least twice, with baked potatoes once and mash another time, or perhaps ring the changes with rice or pasta. Wild rice is desperately expensive here – I have to wait for kind friends to bring me some from the USA, where I gather it doesn’t cost a month’s salary for 50g, and even then dilute it down with plain rice! David- thank you for the recipe. I am going to put it to the test next week for our family Sunday dinner. We are comfort food people, so this is going to fit right in. My mouth was watering as I read the recipe and the article. Please don’t cringe- I am opting for creamy mashed potatoes instead of rice. We love the carbs! Thank you for your exquisite recipes. AND NOW- to troubleshoot those darn macarons! I am running out of almond flour- and egg whites! Maybe I will get them right before Christmas. Good day and blessings. Nothing wrong with mashed potatoes either! We just eat a lot of potatoes in France (mostly because they’re quite good) so I try to add grains to dishes and other things as often as I can, since I like them, too. And because I brought back 4 nice bags of wild rice last time I was in the U.S. and I like treating non-American guests to it. I like the spices in this recipe…I’ve used coffee rub on grilled rib-eyes on occasion and everyone loved it. Don’t eat lots of meat, but when we do I like it to be well prepared with good seasonings. Annabel…and all. I just returned from trip to UK and was served spelt as side/carb with lamb. Absolutely exquisite, and a good substitute for the wild rice. In fact, use David’s seasonings and the cherries with the spelt. 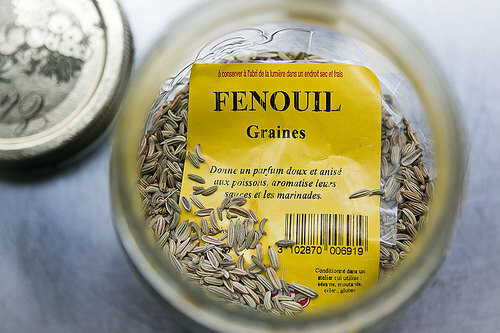 It might even be better, since the spelt absorbs flavors readily, whereas wild rice, unless you let it fully bloom, absorbs little flavor. Price isn’t a factor here in Minnesota, where the rice is grown. I just bought a pound for US$5 for new season crop. A real bargain. No ancho chile powder here in NL. What can I substitute? Smoked paprika would work well. I have some from Spain that’s amazing. Thx David. I have a brand new jar of smoked paprika I just brought back from the States. This looks yum! Dried cherries?? You lucky dog, you, living in Paris. The last time I found dried cherries here was out in Annecy four years ago. I bought 3 kilos (the man at the market looked at me like I was insane, but he didn’t argue) and I’ve been nursing them ever since. Finished them a few weeks ago, but I’m off to the UK in 2 weeks for a major shopping trip. (Ever price paint here? $90/gallon for plain white paint?) So dried cherries, jarred jalapeños, good black tea, panko breadcrumbs, chili chocolate, and smoked chipotle paste, all things I struggle to find here in central rural France, are among my targets. Need anything while I’m there? And thanks for telling me how to order lamb shanks. I’m still a bit timid approaching butchers with new cuts, especially as the animals aren’t butchered quite the same way, so this is precious information! Oh, and can I maybe sub smoked chipotle pepper for the ancho pepper? David – can recipes like these, which call for slow oven cooking, be done in slow cooker or on stovetop at low heat? What’s the advantage of doing them in an oven? Yes, this cook book cooked on the stovetop. I don’t have a slow cooker but would imagine most aren’t large enough to hold 4 lamb shanks. Plus since they should be browned, since you’re using a Dutch oven already, if you transferred them to a slow cooker, that’s be another pot to wash – always want to make less dishes! Doing them in the oven ensures a gentle heat. If you cook them on the stovetop, you may need to use a flame-tamer to diffuse and soften the heat. Most hardware and cookware shops sell them. I think it’s a pretty brilliant move. His place in San Francisco, Stars, melded a bit of glamour to San Francisco while still being lively, without being stuffy. And while I only ate at the bar there, the food was good. I tried the link to find out more about your Paris-Lausanne Chocolate and Gastronomy Tour, but I don’t get anywhere (my computer doesn’t have an email program associated with that address link). Can you give a URL or some other site to find out more about the tour? Thanks. At the top of the page, you can click on Tours, which takes you to information about my annual Paris and Lausanne Tours. There is a link there for you to write for more information or to sign up, if space is available. Thanks! As I live nearby… which is the butcher? Any other suggestion on shops in the area is welcome. I buy most of my groceries at the market in Bld de la Villette on Wed and Sat but I haven’t explored the neighborhood enough. The lamb sounds so good. Original for me. oh these look so good! lamb shanks are hard to find in my neck of the woods. but i’m bookmarking this anyway. A perfect combo cooker (like a slow cooker but with high heat as well) dish. Lamb with coffee and a side dish garnished with sour cherries. I’m there! Thank you, David. When it’s my turn to cook, I invariably buy lamb and, like you, never understood why shanks were so hard to find. I have noticed that I am beginning to see them in the butcher’s case on occasion. This recipe looks and sounds fantastic… one I must try. I’m curious – why did you start going to butchers in Belleville, and why do you keep going there? From my sense of what you have mentioned, that’s not *terribly* far from where you live, but those aren’t your local neighborhood shops either, right? But more importantly, your site is truly a treasure trove-I can’t tell you how many times I’ve relied on your fabulous, and fail-safe recipes, from appetizers through desserts, to wow guests. Thanks so very much for sharing such gorgeous dishes with us all! Love your blog and your recipes! Makes me miss Europe. I just tried this recipe last weekend on a few cuts of lamb shoulder and it was amazing. This week, I could only get a large lamb leg roast, but would like to use this recipe to prep it in advance for a dinner party. Do you think it would work as well with this cut, and would it be okay to keep it for a couple of days in the fridge before serving? I was thinking of cooking it for longer than 3 hours, and then basting the roast throughout the cooking time. Thoughts? Glad you like the recipe! Am not sure about leg of lamb, as the roasting time is different and not sure the flavoring would get into the meat the same way it would with a shoulder or shanks. But you could certainly try it, basting the leg at regular intervals. You might want to add some jam or jelly to the glaze, to help it stick. Thank you for your wonderful blog, it continues to provide cooking inspiration for me. I just made the lamb shanks recipe using some outstanding local lamb, and it was lovely; the seasonings were just right. Thanks again for your blog; its a must read for me. Best wishes from a faithful reader in Canada.